At some point, you may wonder whether your hamster needs a bath. If your furry friend is so stinky they have you pinching your nose when you pass their cage, you may wonder whether they’re dirty. Is a bath the solution? Are there any risks associated with bathing your hamster that you should know about? I’ve researched this topic in-depth to bring you the answer. Hamsters are adept at cleaning themselves, so there’s rarely any need to bathe them, especially in water. If you must bathe them, a sand/dust bath is preferable. This reduces their risk of catching a cold. And if the cage stinks – make sure you clean it thoroughly on a daily basis. A sand bath? What is that even? We know this is a lot to grasp at once, especially if you’re a first-time hamster owner. That’s why we’re going to break down whether you need to bathe your hamster, how often, and how to do it safely. Can I Bathe My Hamster? Bathing your hamster is often unnecessary unless they’re really, truly dirty. Here’s why. Hamsters innately know when they’re unclean and will tidy themselves up. The next time you hold your hamster, watch what they do when you put them back in their cage or enclosure. They’ll probably start grooming themselves. It’s no offense to you, but your hamster doesn’t want to smell like you. The hips of a hamster are home to their scent glands. By rubbing their hips and then grooming the rest of their bodies, they spread that scent and get rid of yours. To them, they’re then considered clean. Hamsters can get dirty in plenty of ways. If they make waste in their enclosure and you don’t immediately clean it up, it could get stuck in their fur. Old nesting, discarded food pellets, dirt, and other messes can also get matted in there. If you see something smooshed into your hamster’s fur, your first inclination is going to be to wash your pet. This is most often the wrong inclination. What Are the Risks Associated with Bathing Your Hamster? Bathing your hamster tends to do more harm than good. Hamsters are already predisposed to getting colds. If left untreated, these colds can be fatal (read more on what can kill your hamster). Putting your hamster in a sink and soaking them in water increases their chances of illness even more. Another major risk associated with bathing your hamster is the health of its coat. Not only does your hamster’s coat contain scent glands, but it also has protective oils. These oils keep your hamster healthy. Without them, they’re much more susceptible to getting a cold. What Other Cleaning Methods Are Available? Now that you know it’s best to keep your hamster away from water, how can you clean them if they get dirty? You can try any of the following methods. Instead of reaching for the faucet when your hamster is dirty or has something matted in its fur, you should reach for the brush instead. Brushing keeps your hamster dry but can remove most dirt, feces, and other caked-on messes. You can use a specialized hamster brush for the job or even a toothbrush if that’s handier. If you have a breed of hamster with longer fur, brushing should be a regular part of pet ownership anyway. You want to brush slowly and gently, going from one body part of the hamster to another. While you’re doing this, keep your eyes open for signs of abscesses, tumors, and other skin conditions. If you notice that the hamster’s rear has wet areas, especially if it’s a Syrian hamster, then you’ll want to get your pet to a veterinarian, stat. They could have wet tail disease, a condition that affects the intestines. 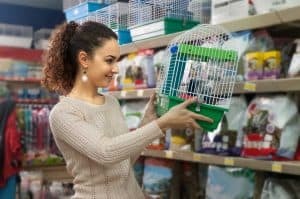 If brushing fails to clean your hamster’s fur to your liking, then you might want to trim out the feces or other substance gumming up their fur. We recommend you use a small pair of grooming scissors for this. Gather the fur you want to trim between several fingers. Make sure your hamster is holding as still as possible. Holding the scissors in your other hand, swiftly yet carefully trim the matted, dirty fur. If you’d rather not get a pair of scissors anywhere near your hamster (good call! ), you can always opt for what some people call a dust bath and is actually a sand bath. Despite the word “bath,” there is no water in a sand bath. You simply fill a container with sand. Make sure your hamster can fit in said container. They need sufficient room to move and roll. As your hamster tumbles about in the sand, most messes on their fur will come off. This is especially true of dirt and hardened feces. Don’t just grab dirt from your garden or sand from the beach. You need to buy specialized sand that’s designated for hamsters and other small critters, like this product. Double-check that the product you get is actually sand. Your hamster could have respiratory issues if you use dust instead. Finally, you have the option to spot clean your hamster. You will have to use water for this, so it’s not recommended. You should try to exhaust the above options first. Use a soft cloth or even a washcloth for spot cleaning. Wet a portion of the cloth and then clean the dirty area(s) of your hamster. Make sure the temperature in the room is warm, as this will help the hamster dry. Let them air dry fully. Feel the area you spot-cleaned to check that it’s dry. Once it is, put your hamster back in their cage or enclosure. You can also get pet wipes like these to quickly and effectively do some spot cleaning as may be necessary. There are some scenarios in which bathing your hamster is the only option. 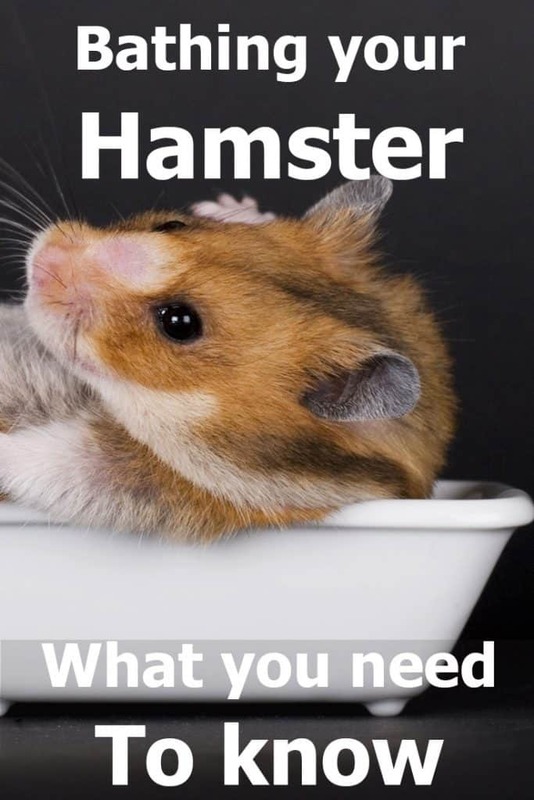 If your hamster got into poisonous substances, a bath is the safest choice considering the overall risk management. A bath does not mean you fill your sink and toss your hamster in. Sure, most hamsters know how to swim, but they prefer not to. You can either bathe your hamster by wrapping them in a wet cloth or brushing them with a wet toothbrush. If you use a wet cloth, then it’s important you rub the cloth over the hamster’s fur. This should dislodge any messes. A toothbrush allows you to target the areas you can see are dirty. If you must bathe your hamster, the goal is to keep them as dry as you can. This preserves their natural protective oils. Water is all you need to clean them; never use dish soap, shampoo, or conditioner. Just as important is drying your hamster. They must be fully dried before they go back in their cage. If they’re even damp, they could get sick and potentially die. You can either let your hamster air dry, as we mentioned before or use a dry cloth. Never use a hair dryer or put them near a heater or other heat source! 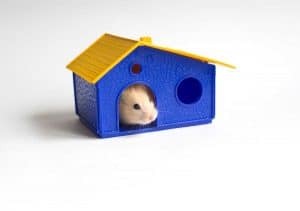 Clean your hamster’s enclosure weekly. See our guide on how often to clean a hamster’s cage. Change out the litter every day. Always keep an eye on your hamster’s enclosure. If you’ve noticed they’ve made waste and are too close to it, you may opt to clean it up yourself. Keep toxic substances away from your hamster. These include gum, paint, nail polish, and certain foods (see the full list of foods to avoid here). This will reduce your need to bathe your hamster. A Dry Hamster Is a Healthy Hamster! While you can bathe your hamster in water, as we’ve mentioned, this is reserved for worst-case scenarios only. 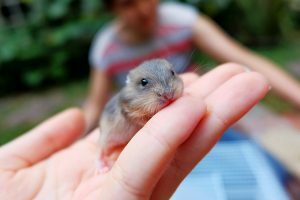 If your hamster has not gotten into toxic substances, then try a sand bath, brushing, trimming, or even spot cleaning first. Above all else, don’t forget that your hamster knows how to keep themselves clean. Leaving your pet to their natural grooming process and keeping them dry is best for their health.